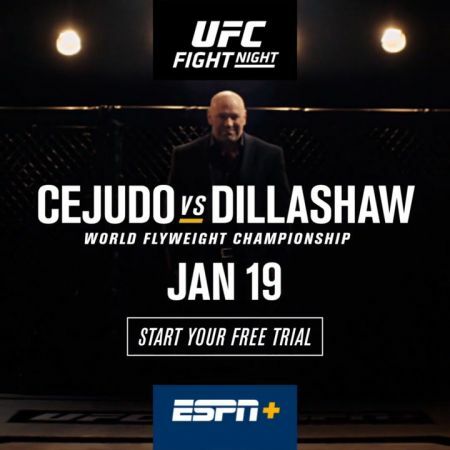 The main card for UFC Fight Night 143 will see current champion and Olympic gold medalist Henry Cejudo placed in the octagon with current two-time Bantamweight Champion T.J. Dillashaw. The two will face-off for the Flyweight Championship on Jan. 19 at New York’s Barclays Center. Can’t make it to New York, but want to catch the action? ESPN+ has got you covered. With ESPN+ you can stream all the UFC action on a wide range of supported devices. Watch from your mobile device, or get an HD full-screen experience on your TV with connected device partners. ESPN+ also hooks it up with full-game replays on demand. You can even stream PPV fights from anywhere through ESPN+ and pause and rewind live games. Your ESPN+ subscription doesn’t stop at UFC. ESPN+ also features a selection of live games from MLB, MLS, and NHL. Get in on the action of select PGA TOUR golf, Top Rank Boxing and Grand Slam tennis from Wimbledon to the US Open and Australian Open. You even get instant access to your favorite college sports, like football, basketball, lacrosse, softball and more. With ESPN+ you’ll also have access to tons of exclusive original content, including; “Ariel & The Bad Guy,” the entire “30 for 30” archive, and Dana White’s “Contender Series,” exclusively on ESPN+. Be sure to tune-in to UFC Fight Night 143 on ESPN+ on Jan. 19. Start your free trial now.